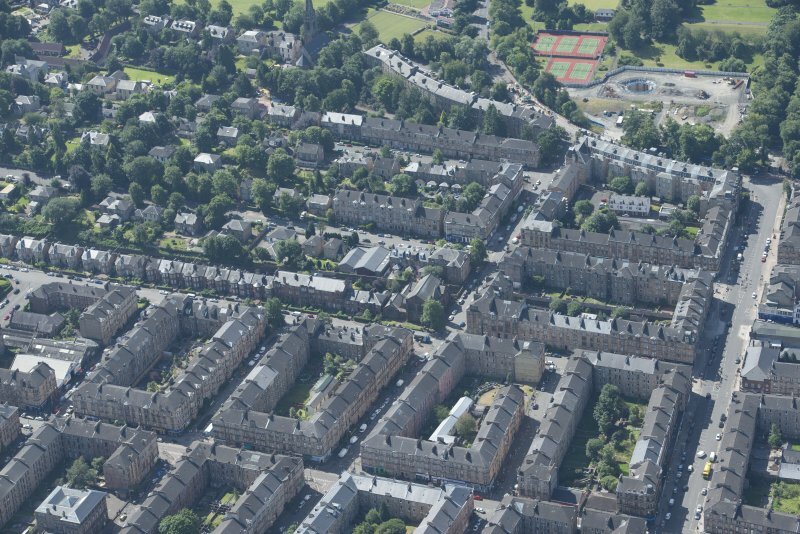 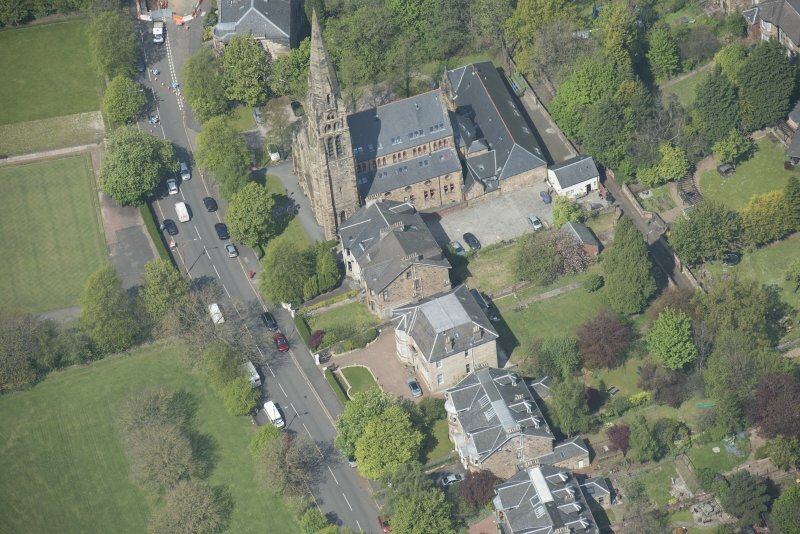 Oblique aerial view of Queen's Park Church and Hall, looking NNW. 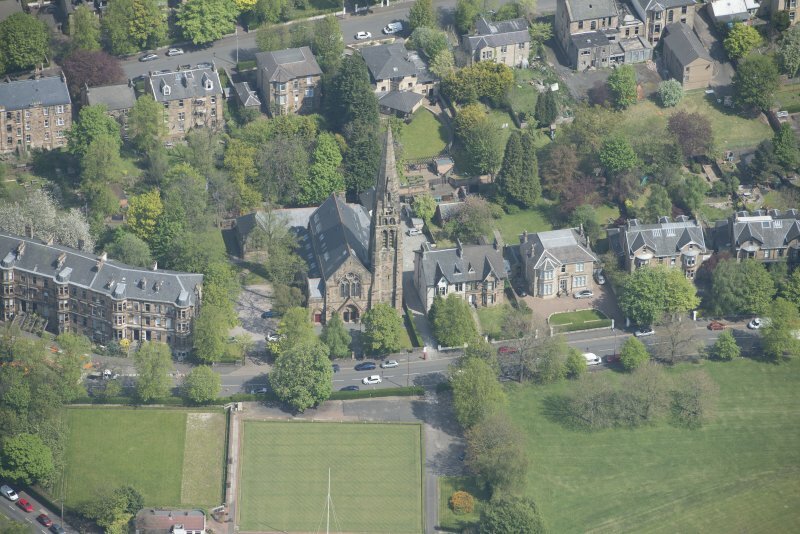 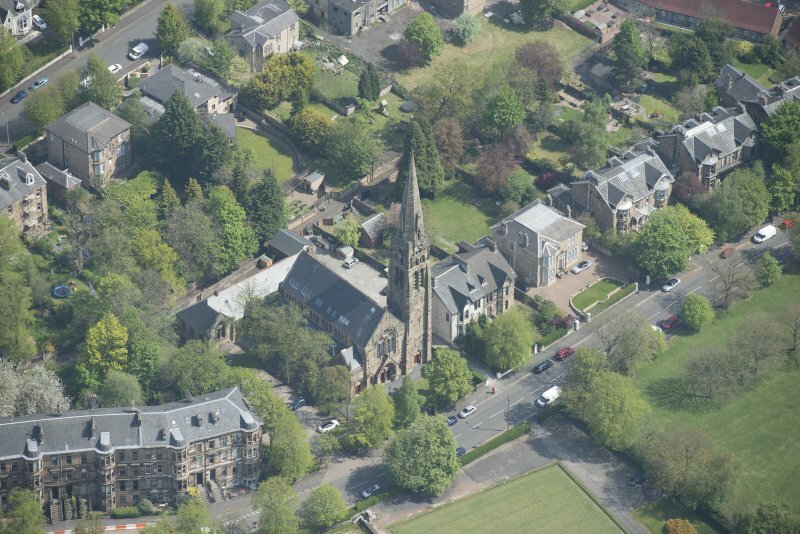 Oblique aerial view of Queen's Park Church and Hall, looking NNE. 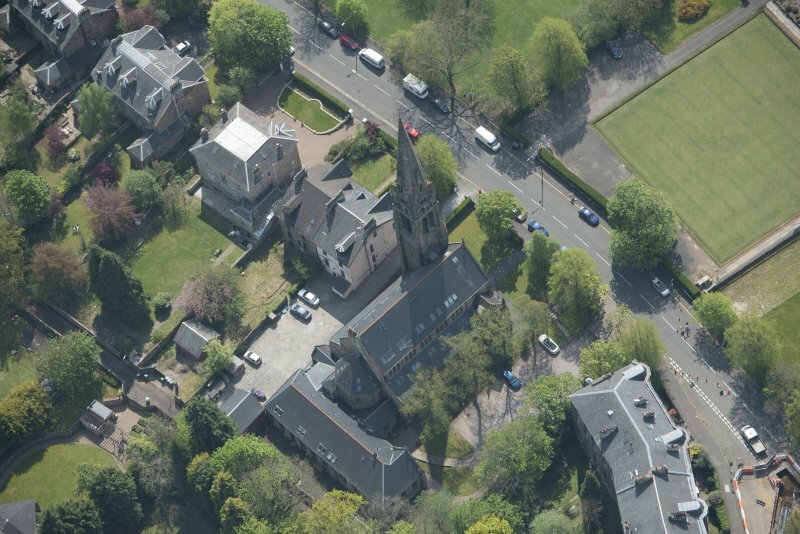 Oblique aerial view of Queen's Park Church and Hall, looking NE. 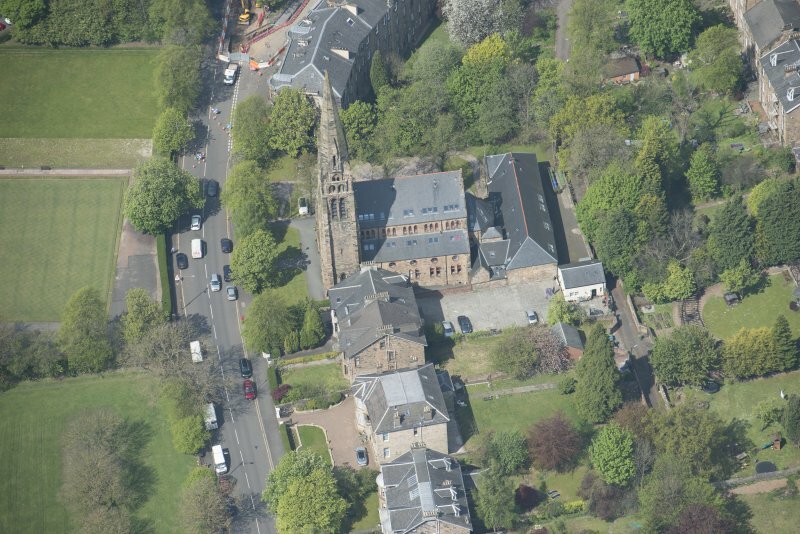 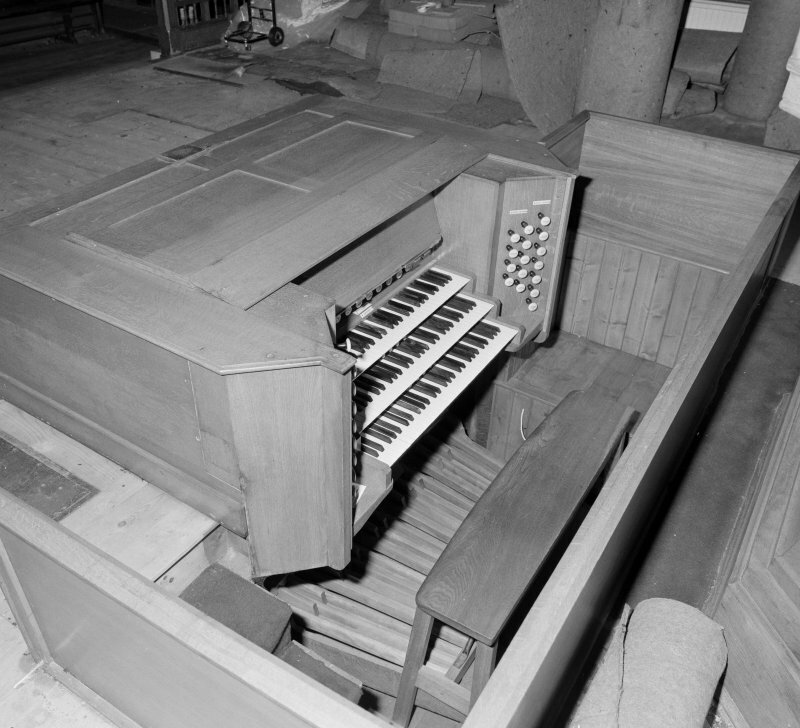 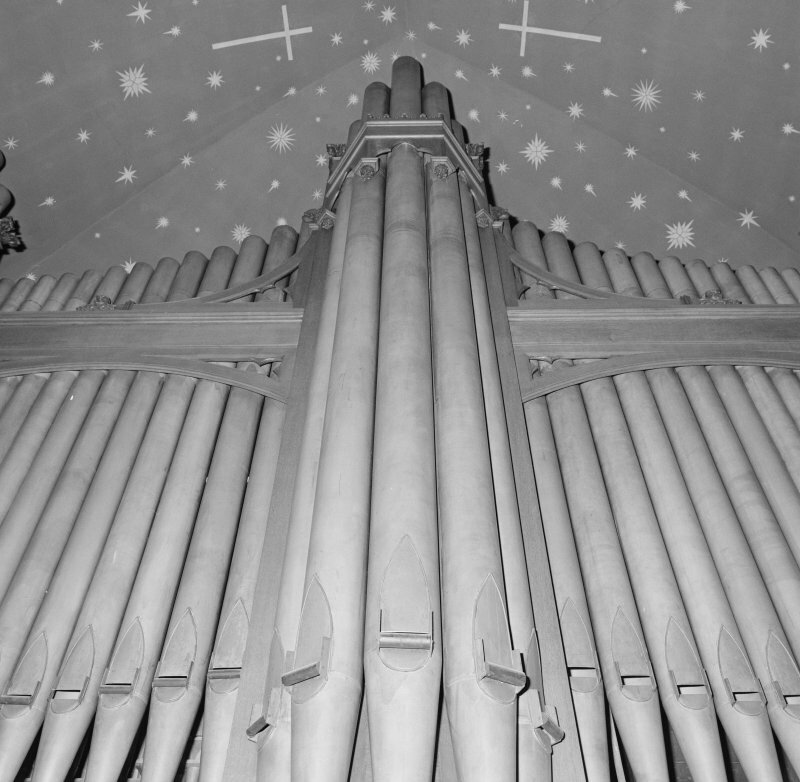 Oblique aerial view of Queen's Park Church and Hall, looking S.
Detail of organ pipes and stencilling in the "apse". 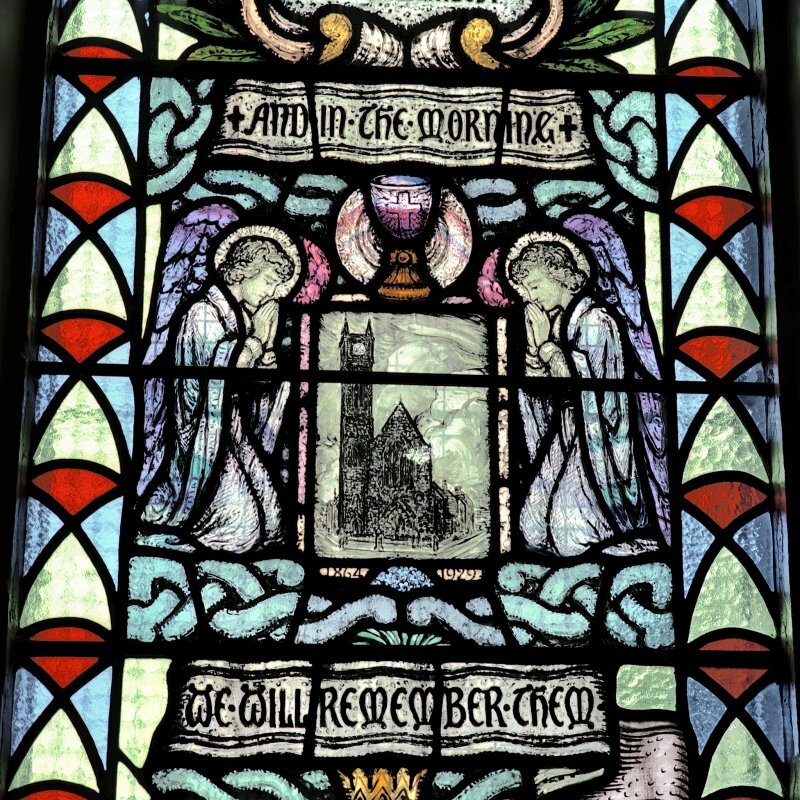 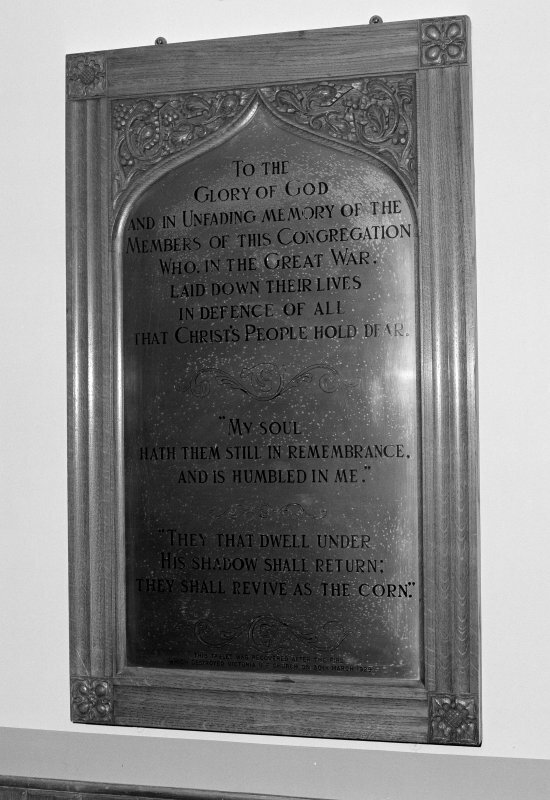 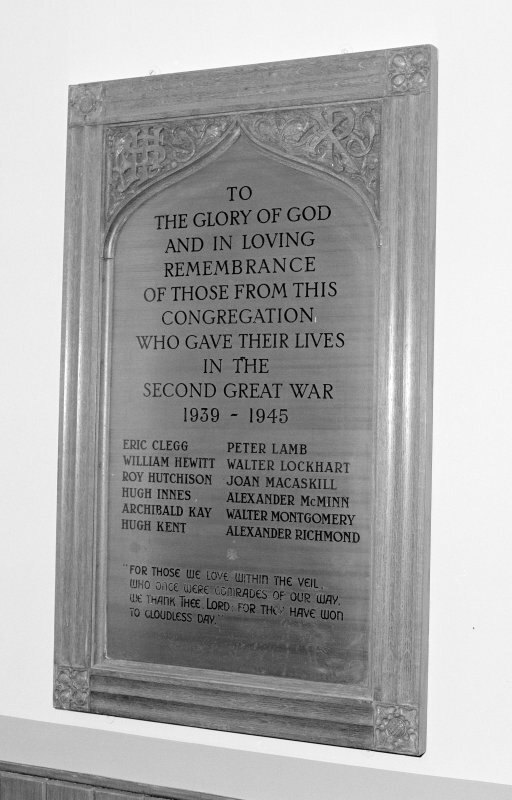 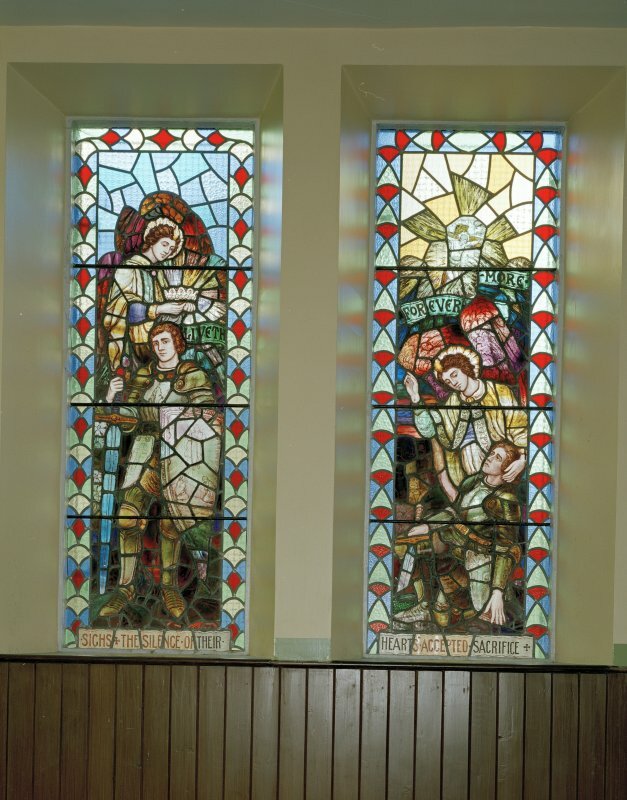 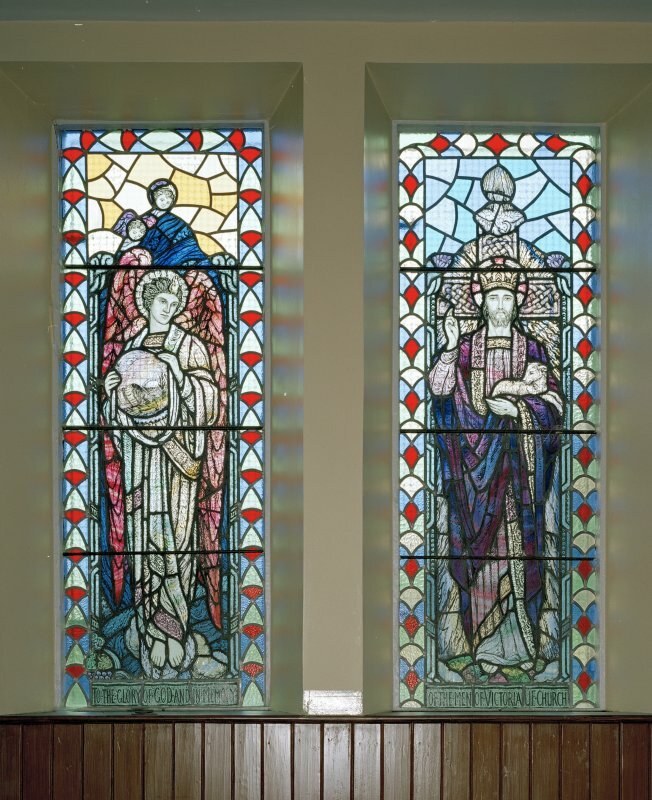 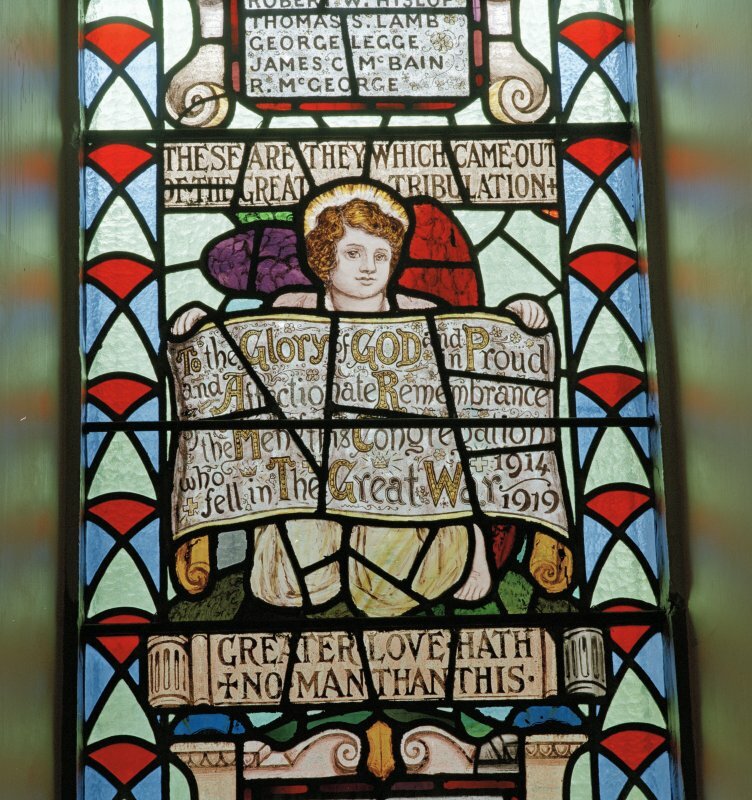 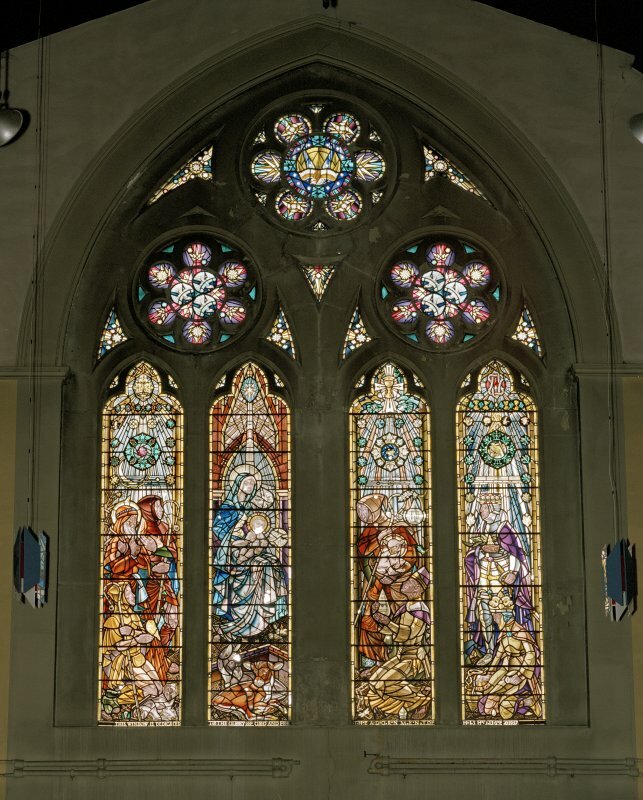 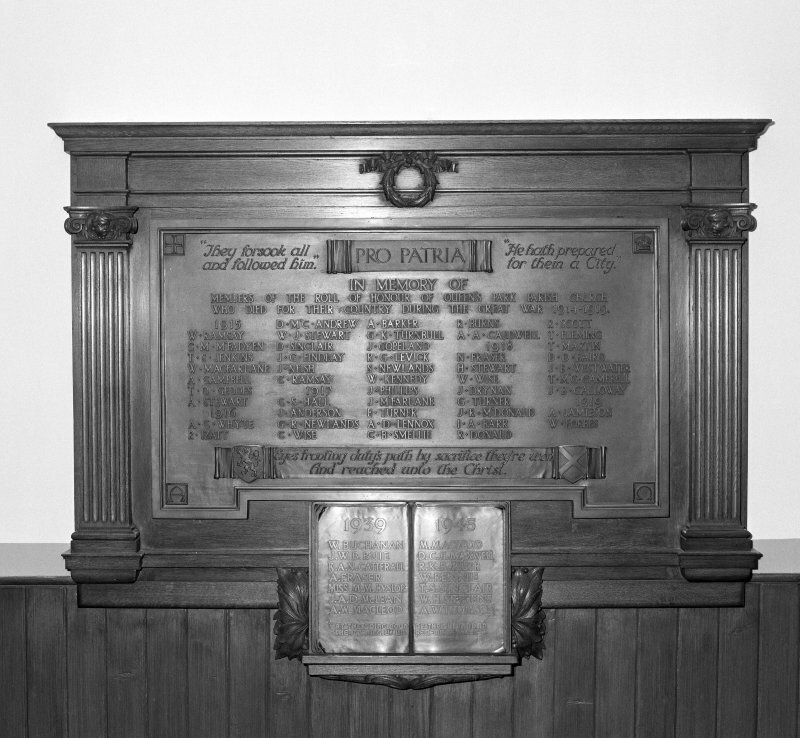 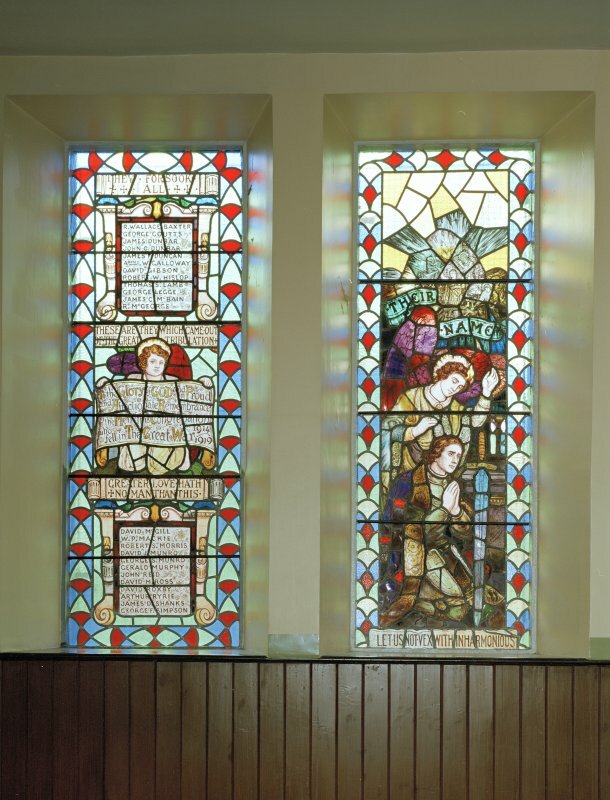 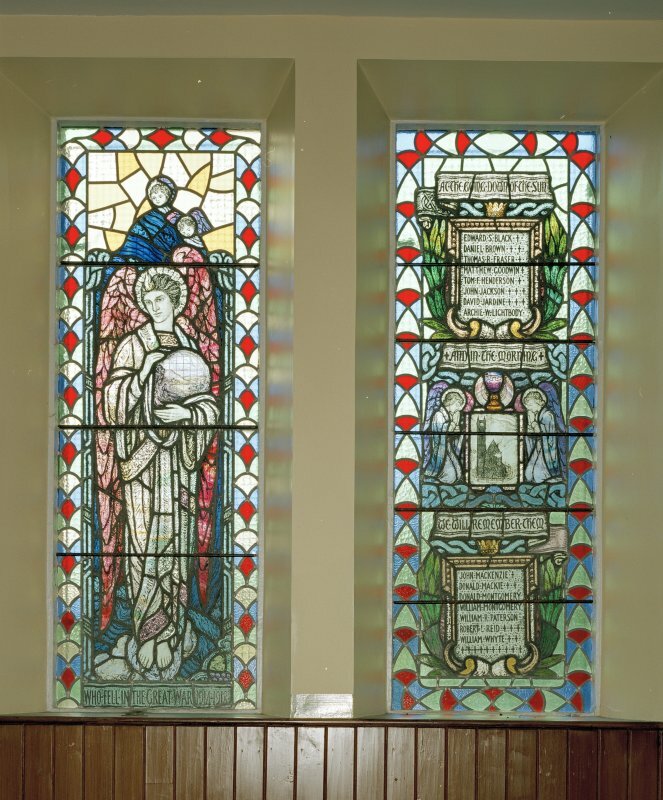 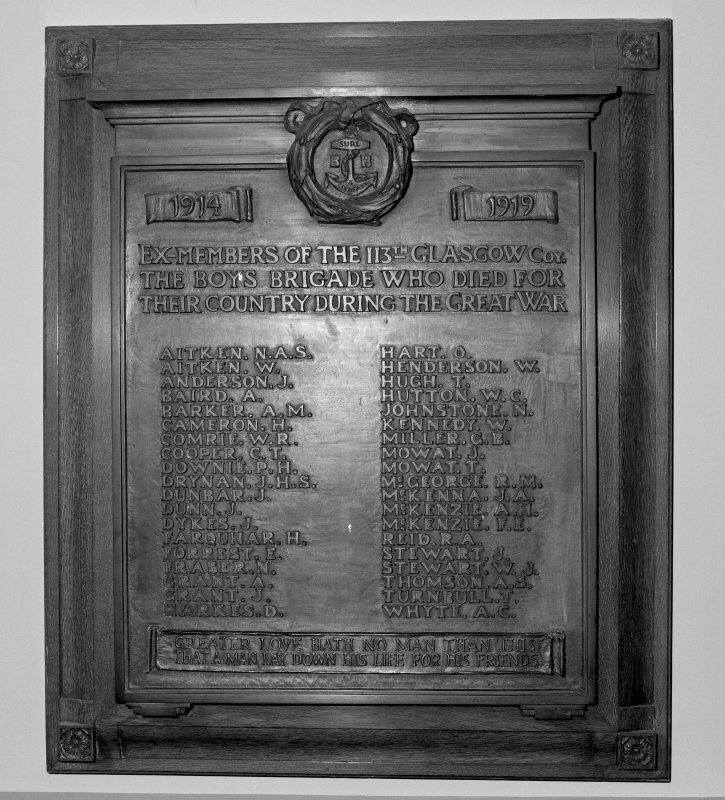 View of 1914-1918 War Memorial stained glass window originally in Crosshill Victoria Church. 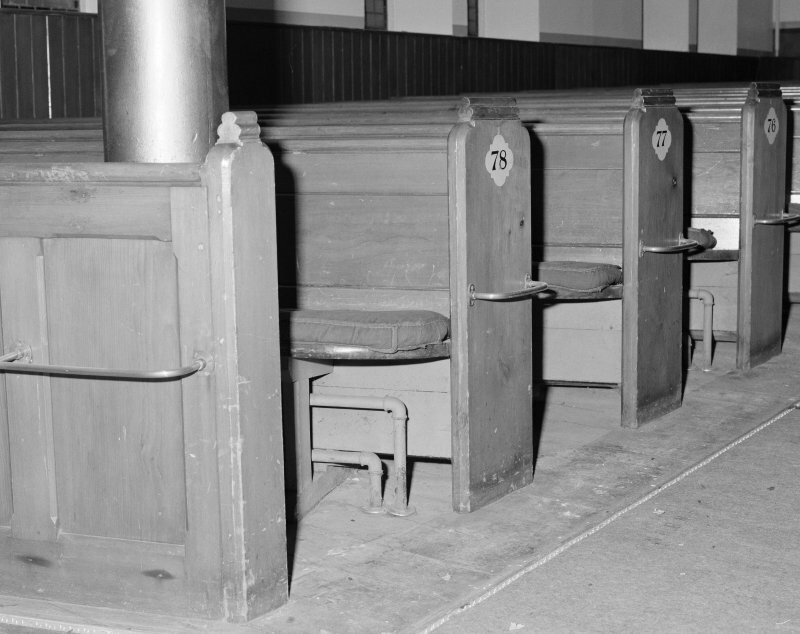 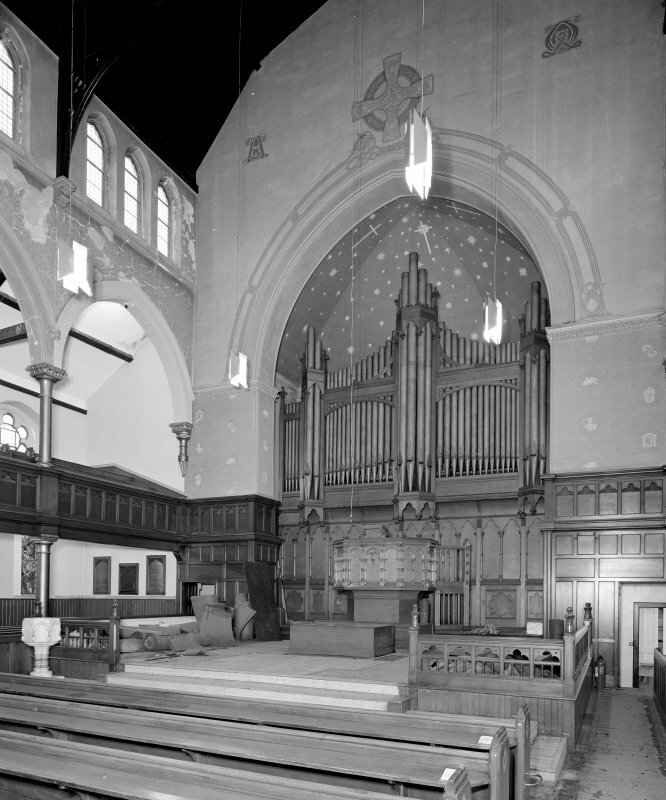 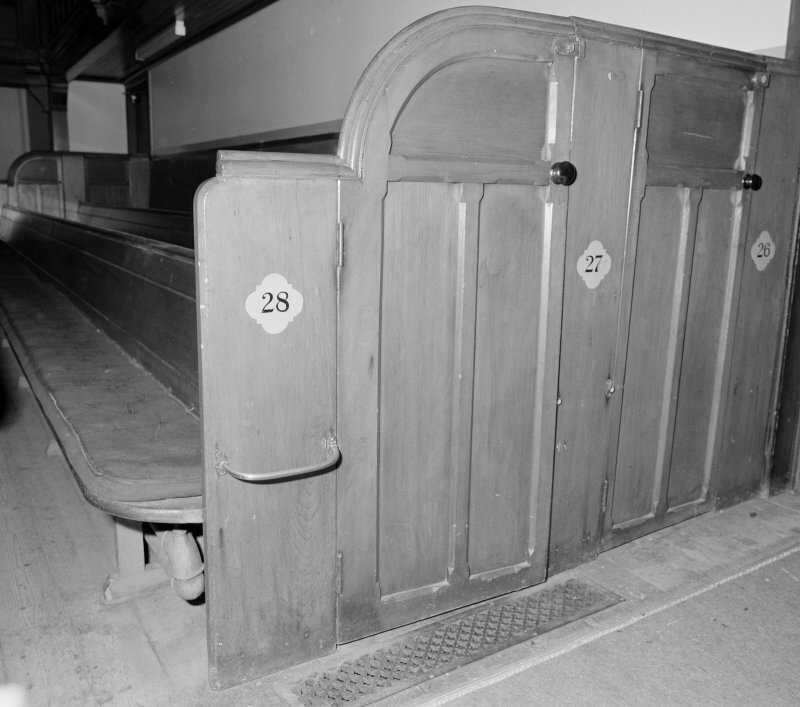 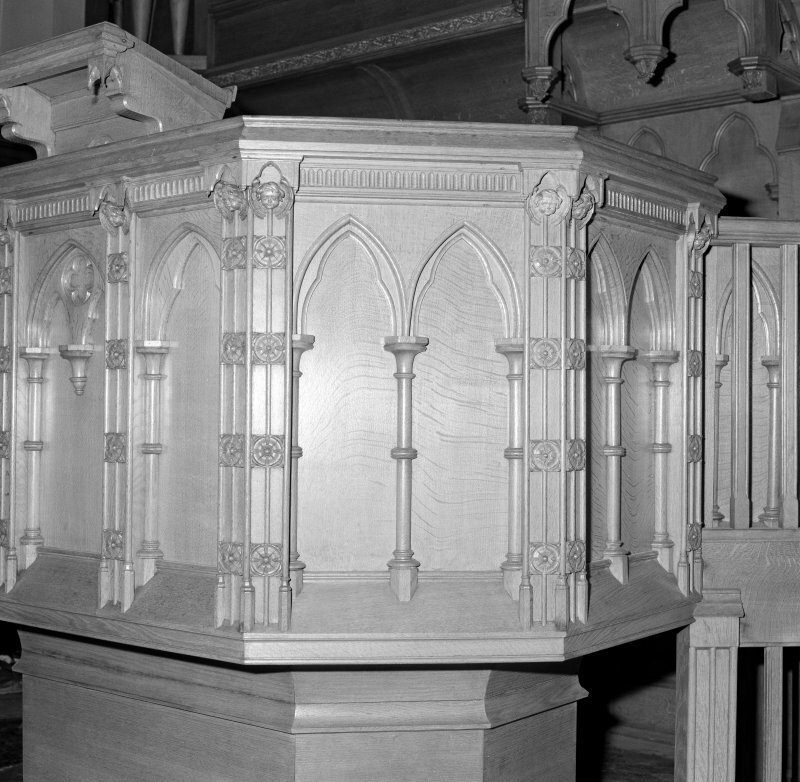 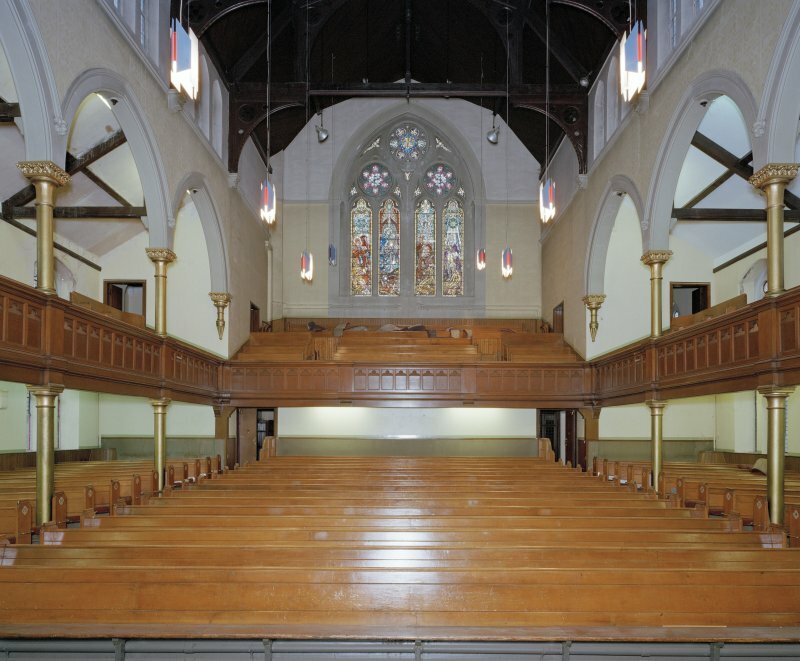 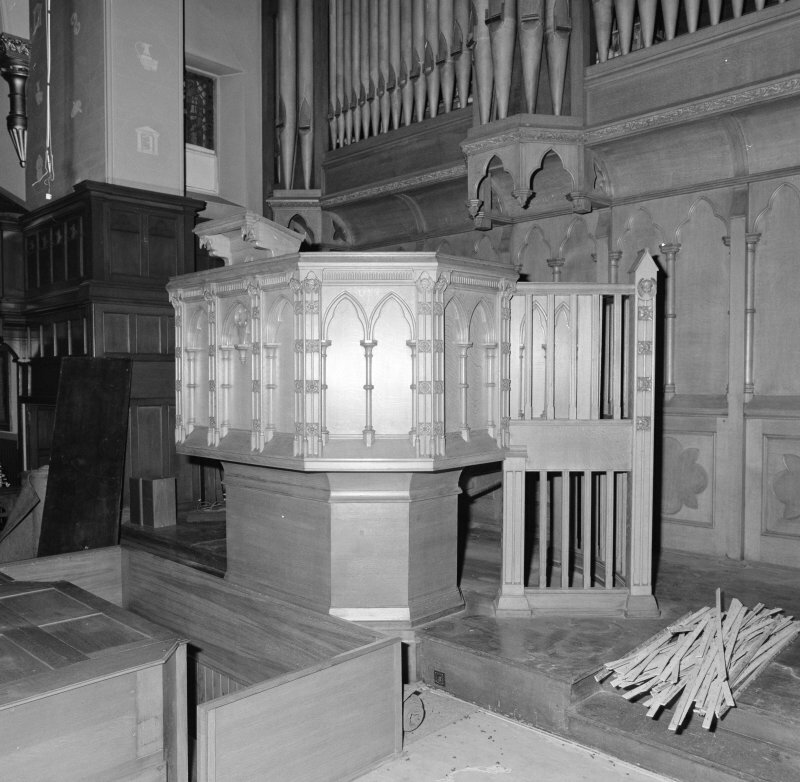 Interior view from gallery to South showing the pulpit and the organ apse. 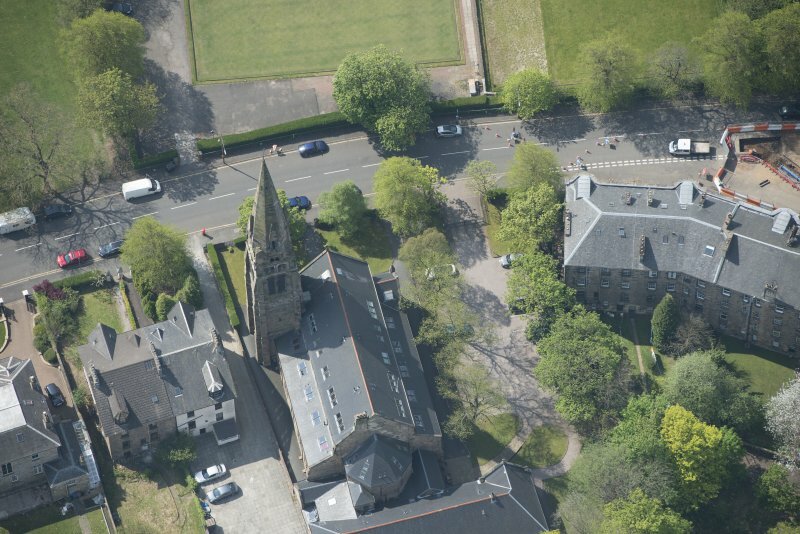 Oblique aerial view of Queen's Park Church and Hall, looking N.
Oblique aerial view of Queen's Park Church and Hall, looking SSE. 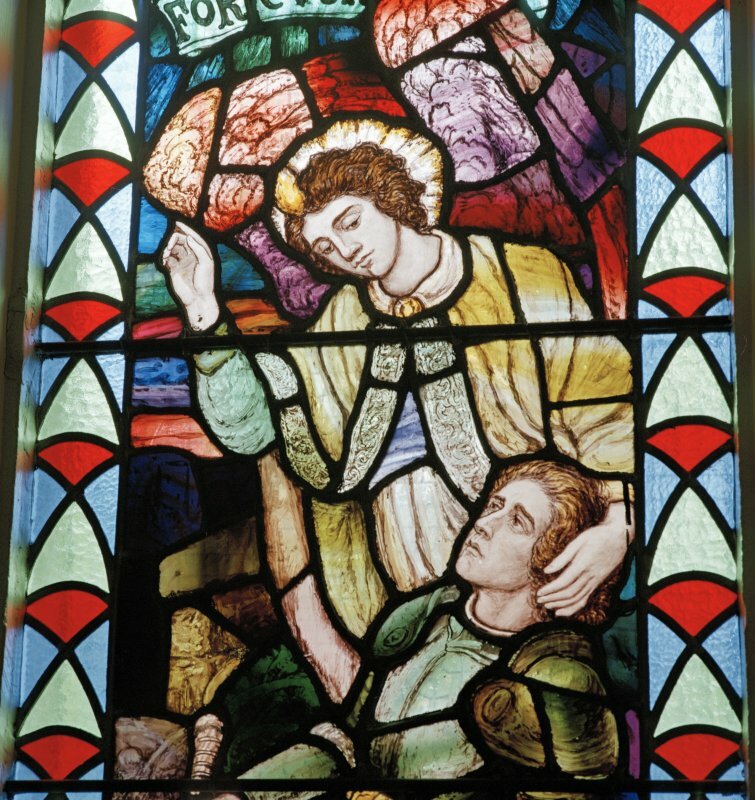 Detail of 1914-1918 War Memorial stained glass window originally in Crosshill Victoria Church. 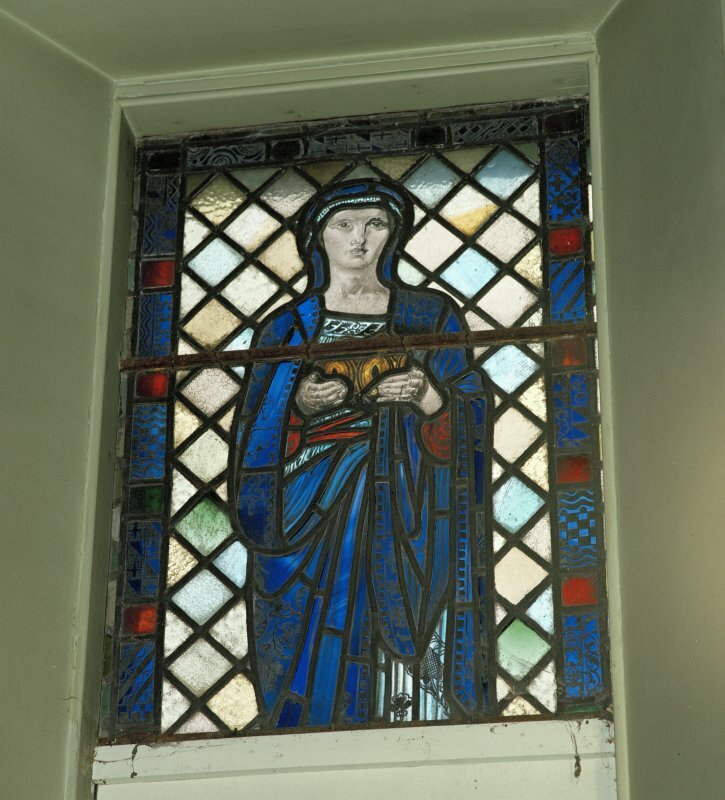 View of reused stained glass window depicting a lady to the East of the organ..
View of South stained glass window depicting the Adoration of the Magi by C Paine for Guthrie & Wells 1957. 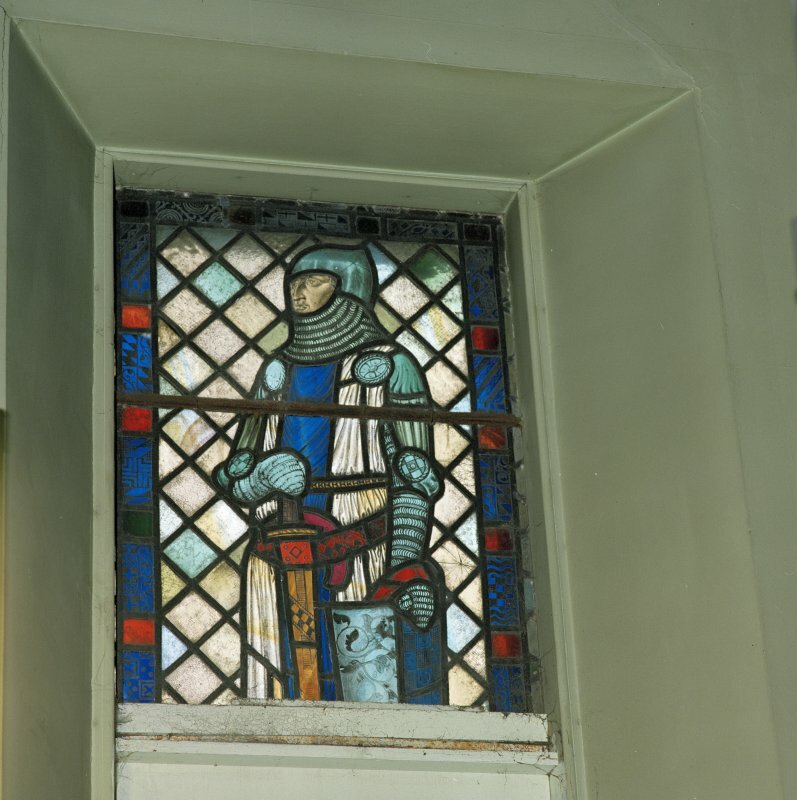 View of reused stained glass window depicting a knight to West of the organ. 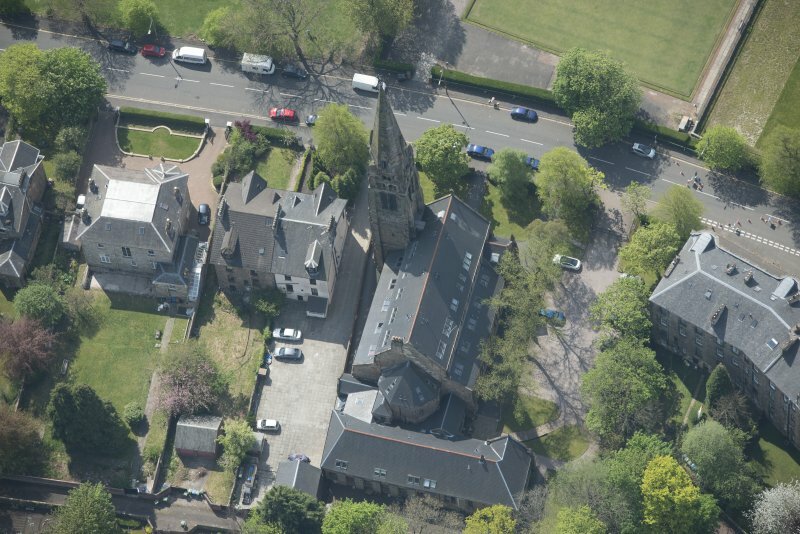 Oblique aerial view of Queen's Park Church and Hall, looking NW. 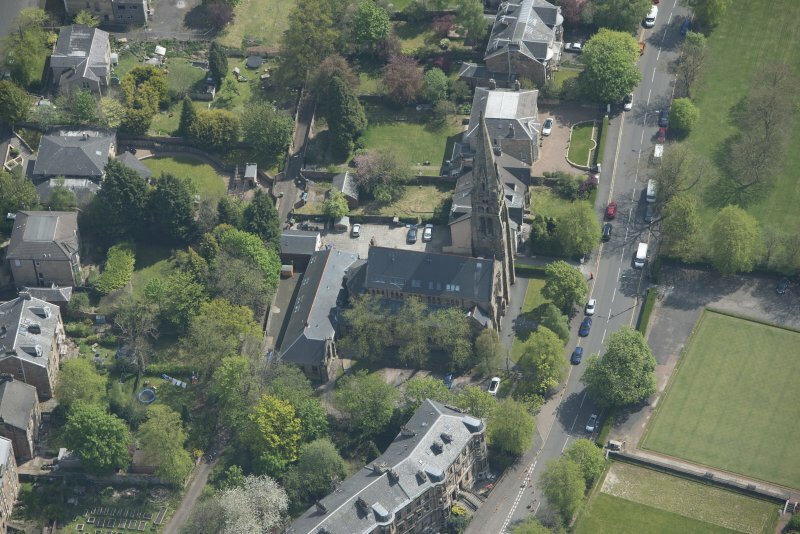 Oblique aerial view of Queen's Park Church and Hall, looking SE. 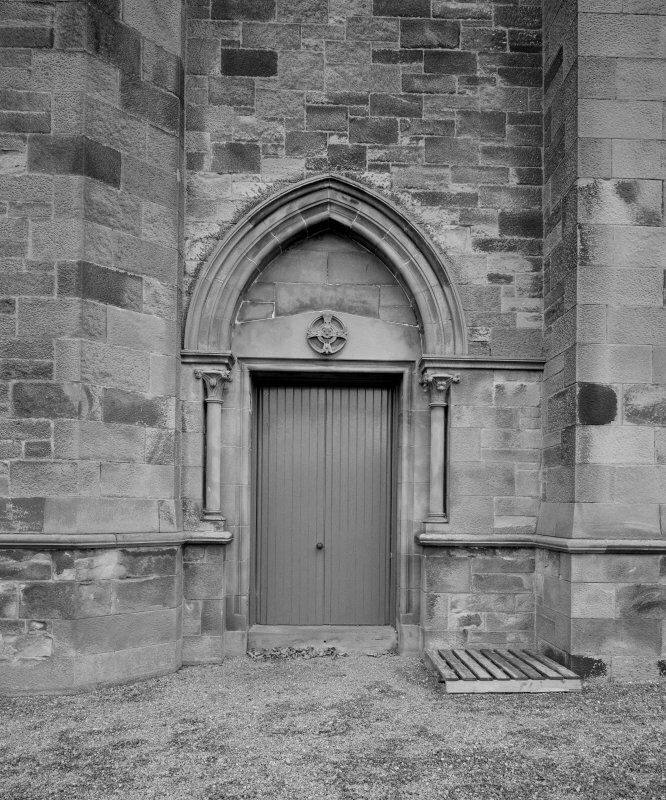 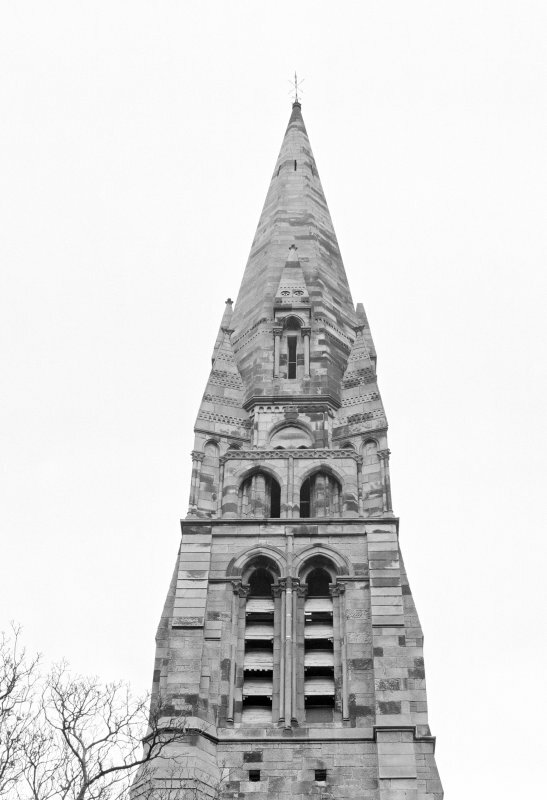 Franco-German Gothic, massive buttressed square south-east tower with tall octagonal spire. 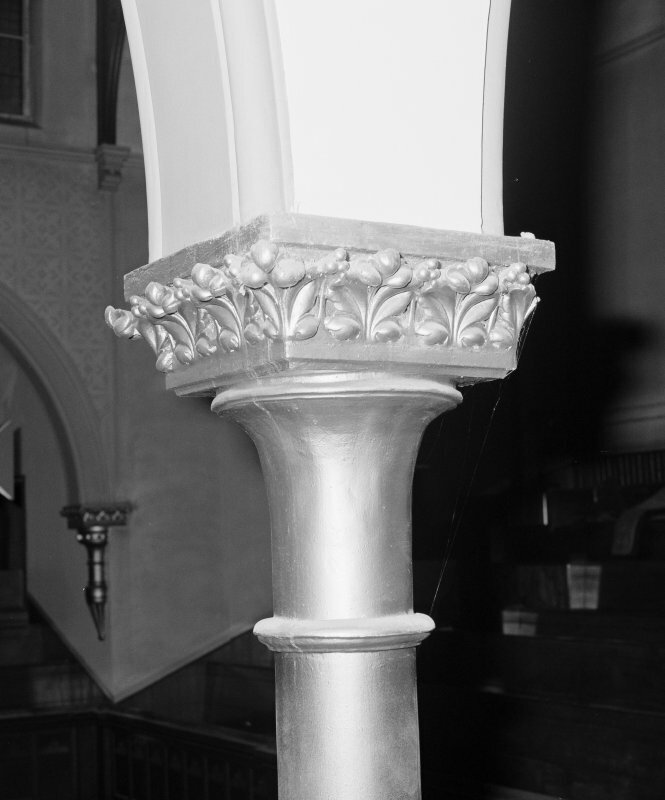 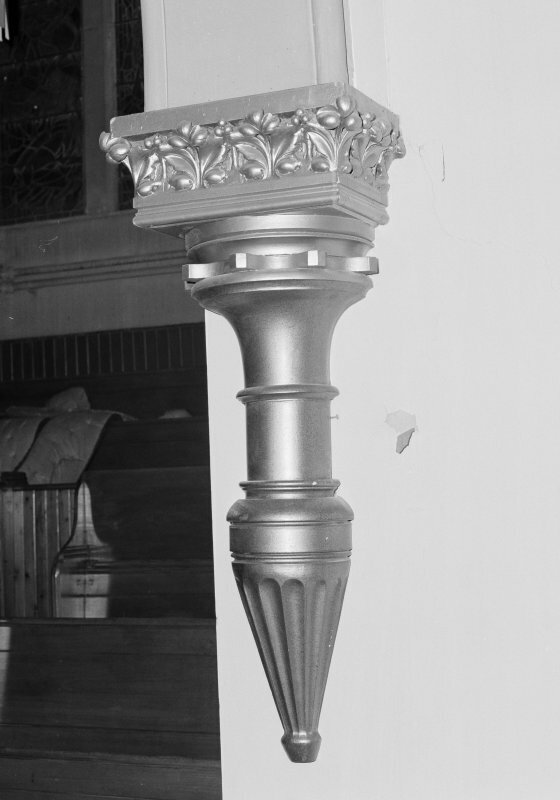 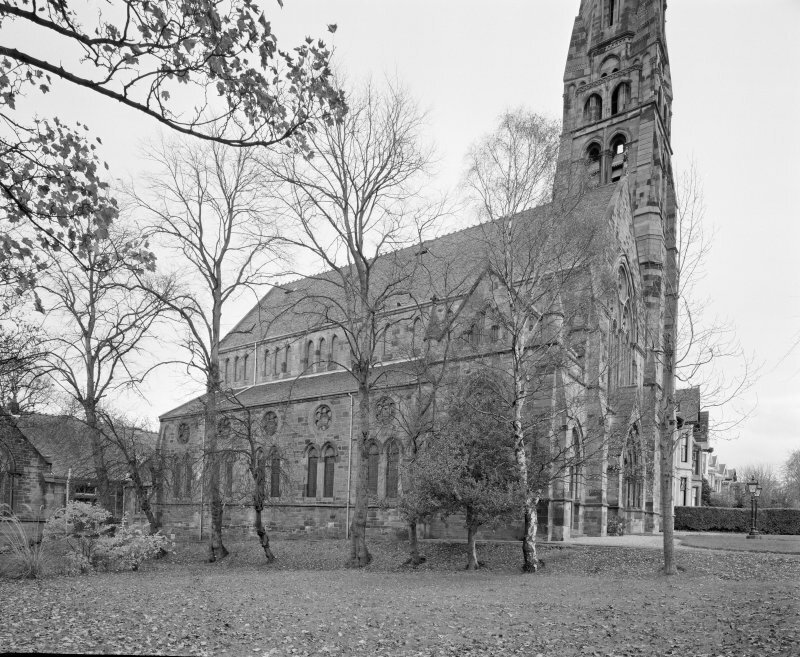 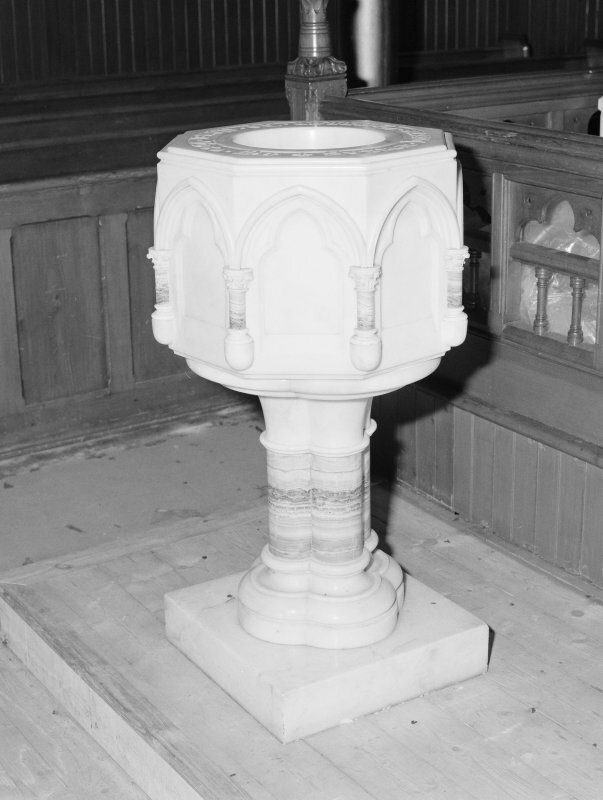 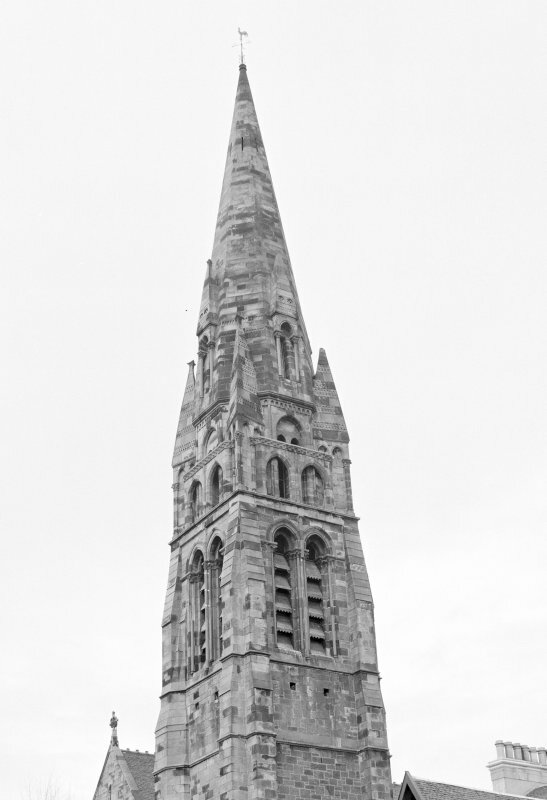 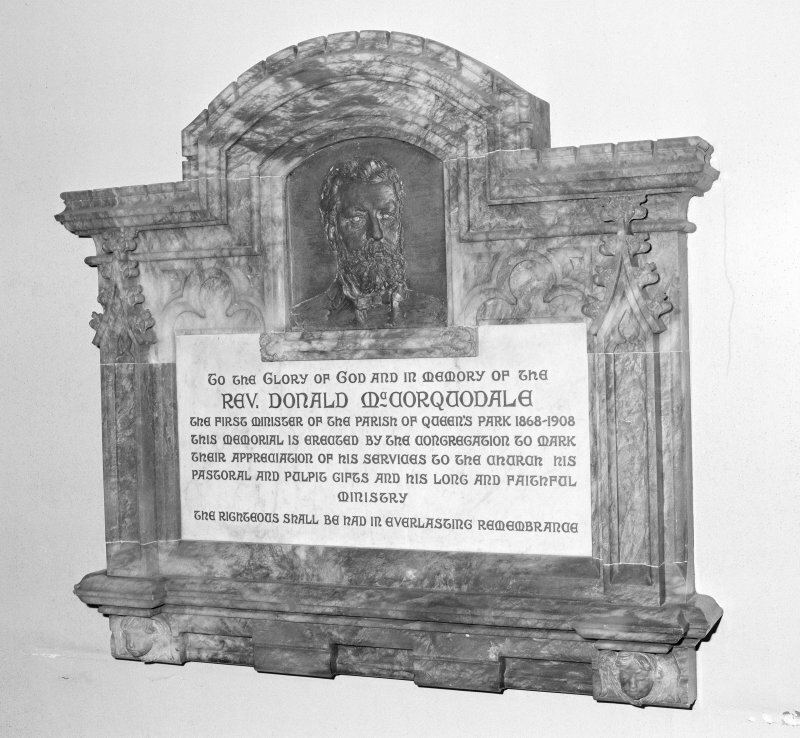 Douglas's earlier partner J J Stevenson may have had a hand in the design before he left for London, but the adventurous spire is more suggestive of Sellars' hand. 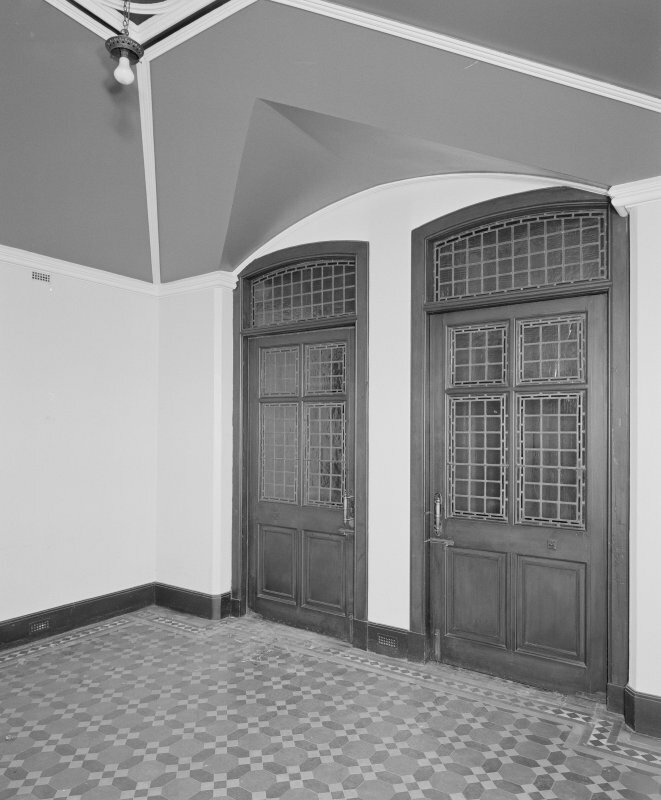 Large Geometric traceried window over wide gable porch. 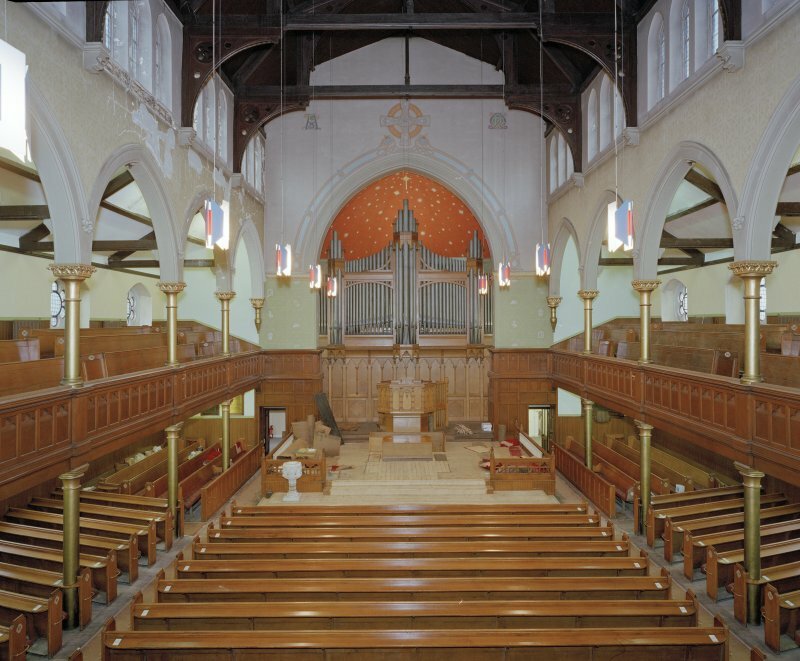 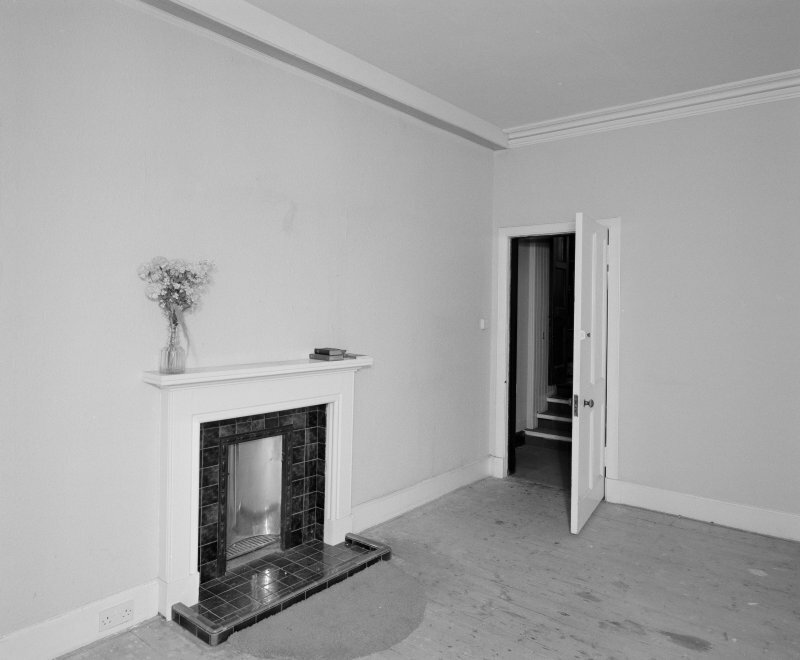 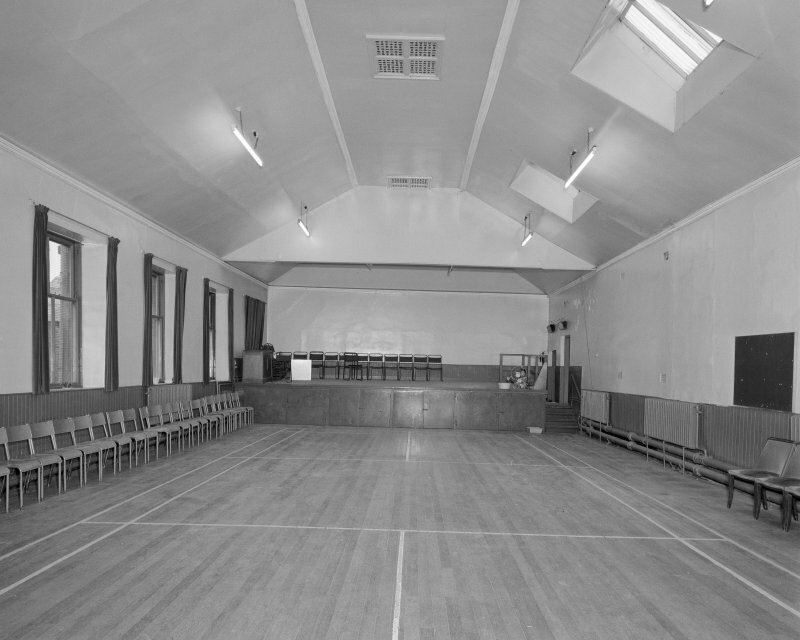 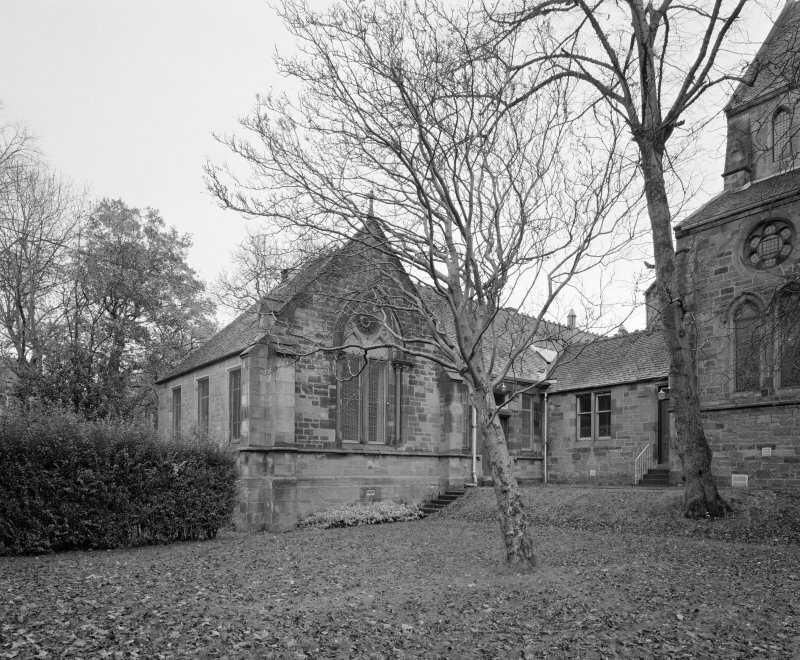 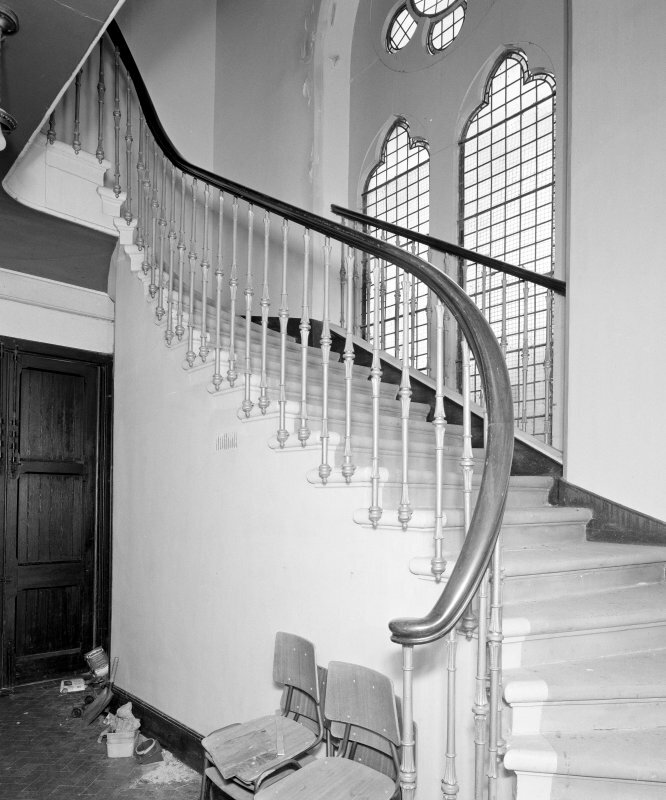 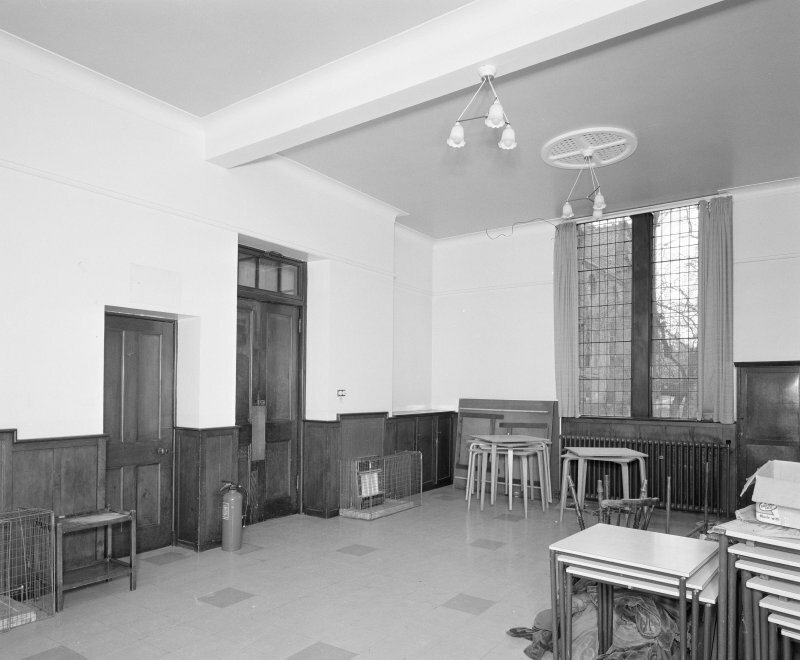 The clerestory windows helped in the conversion to flats, 2004. 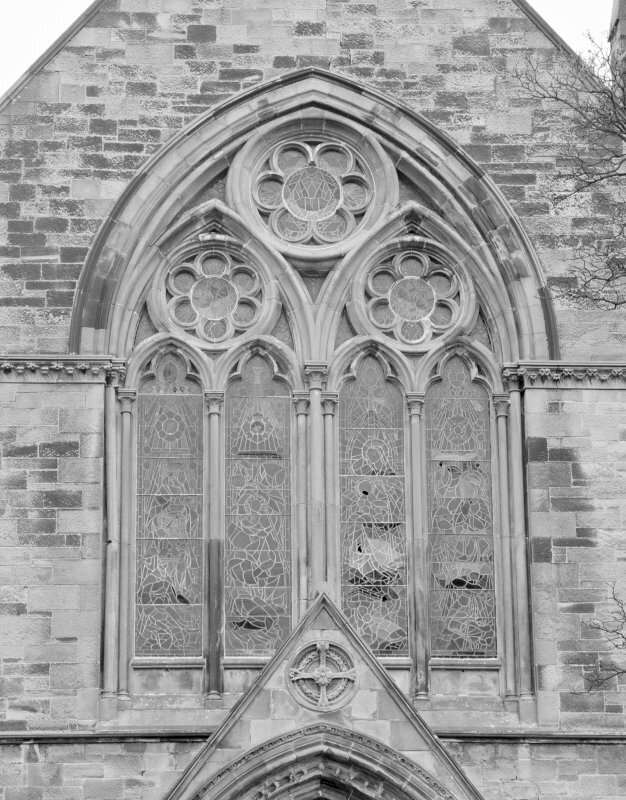 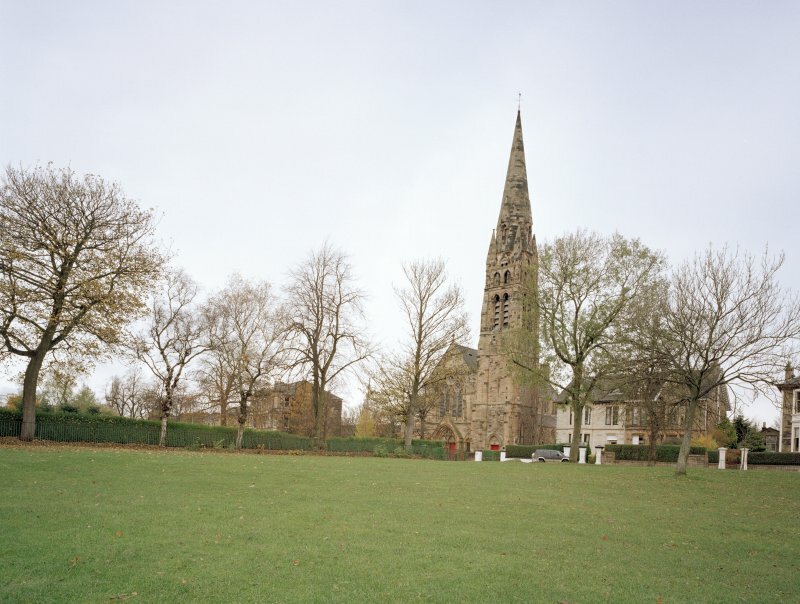 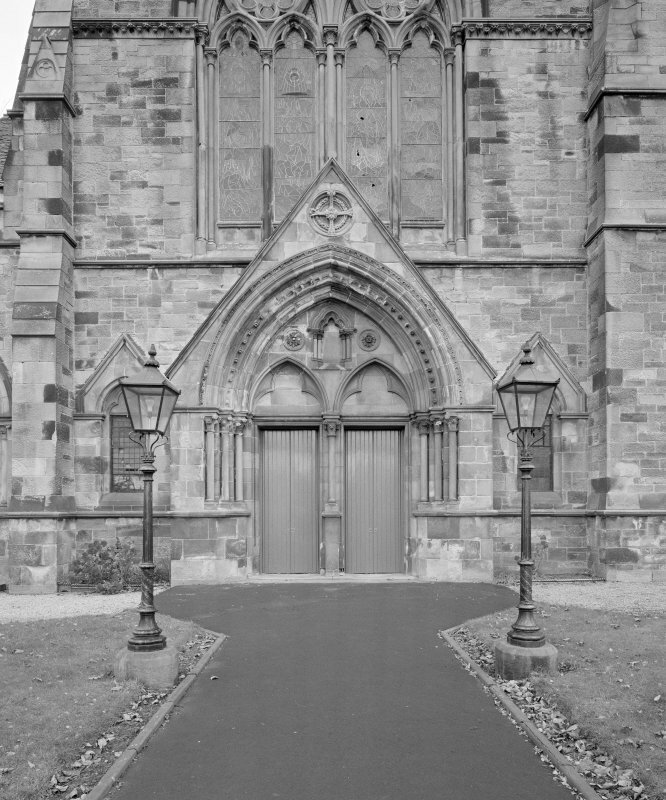 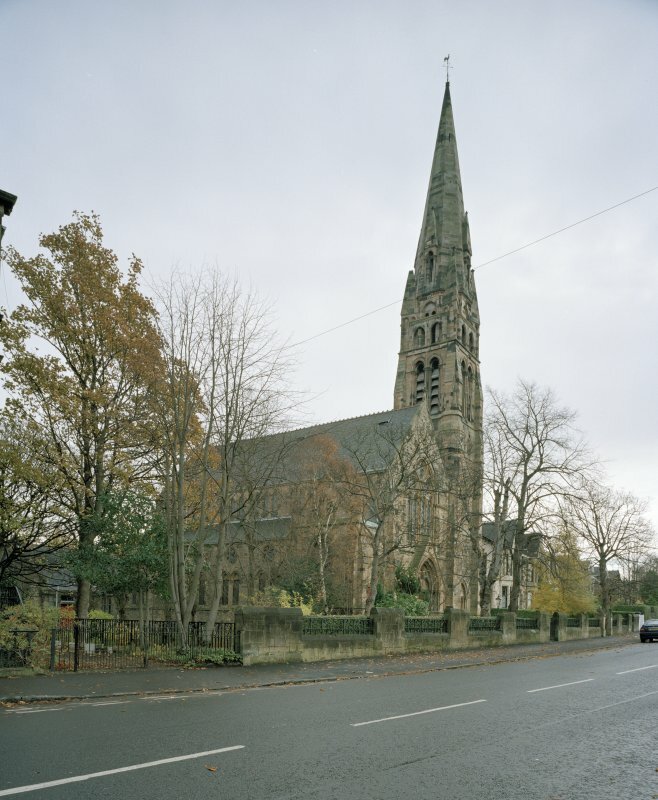 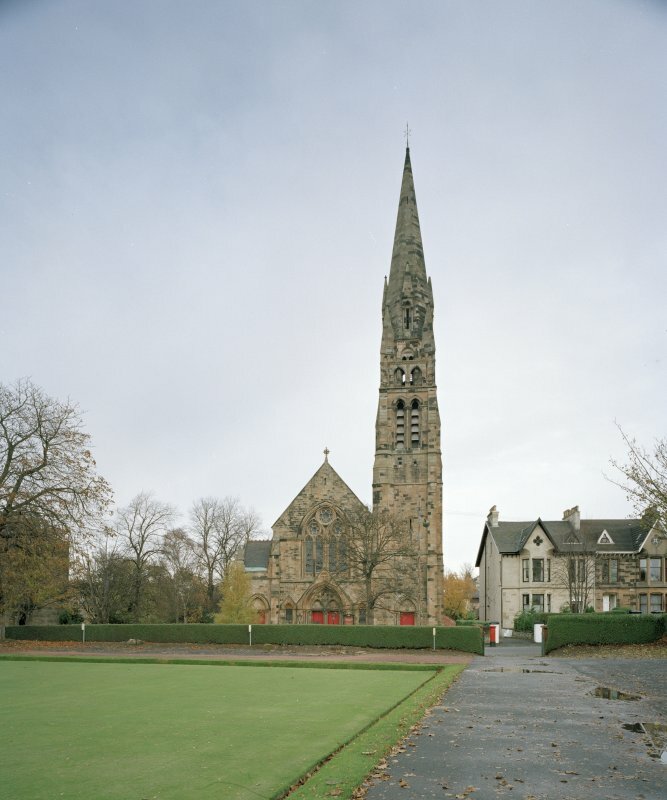 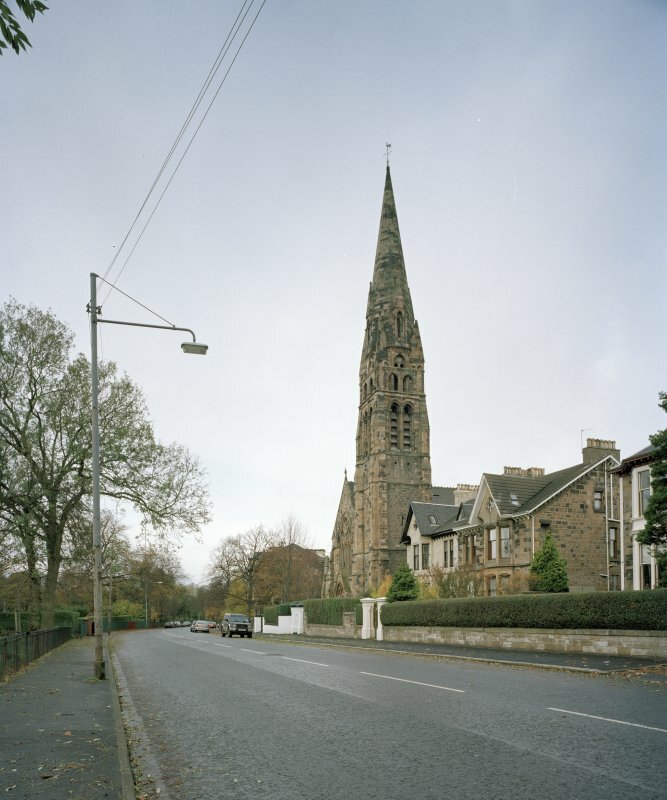 Glasgow, 40 Queen's Park Drive, Queen's Park High Church. 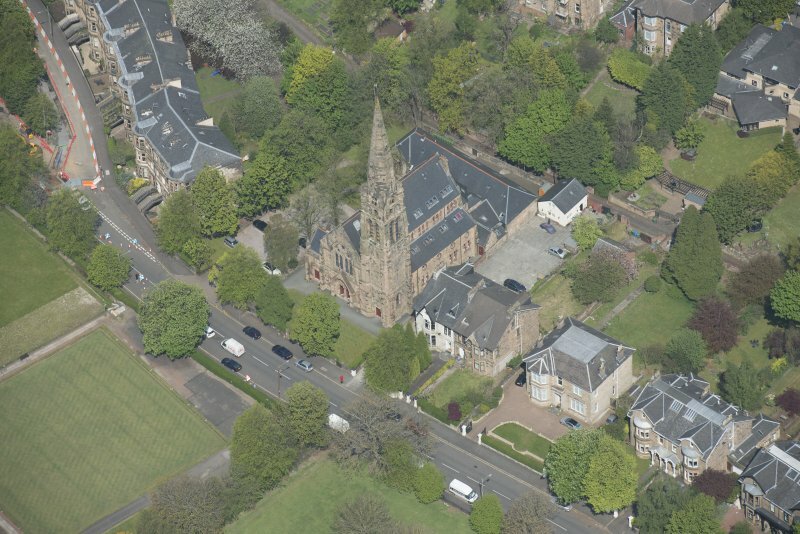 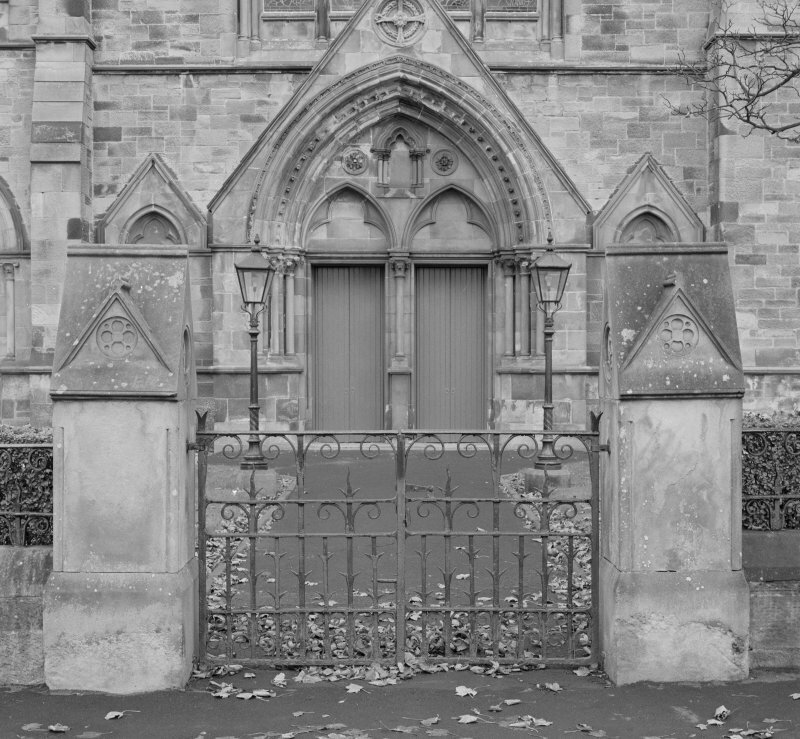 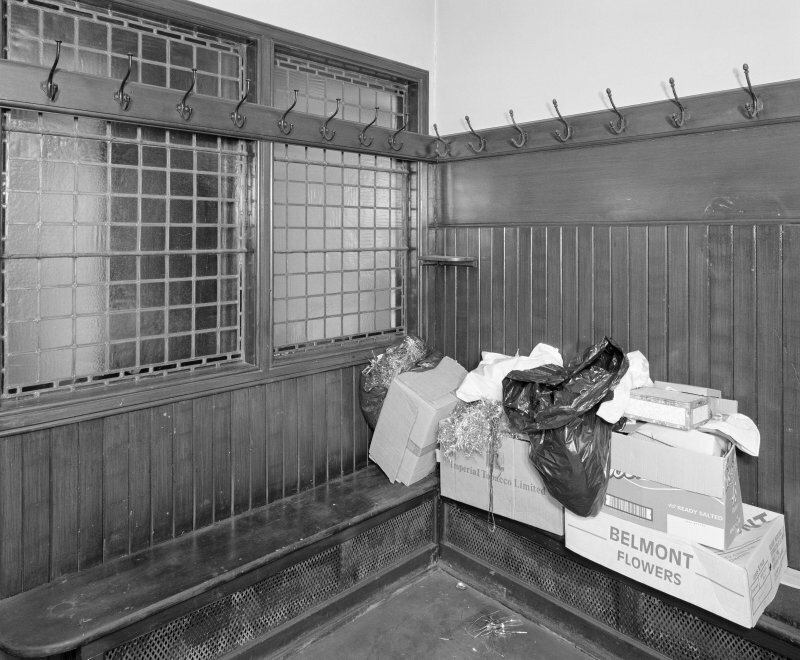 ARCHITECT: Campbell Douglas & Sellars 1872-73 (Sellars).